Nature, Creative, HDR, Macro, Historic, Rusty, Abandoned, Night, etc. Many years ago I was inspired by a gifted photographer named Nancy Rotenberg. She not only created the most wonderful images, but she thrived on mentoring others to do so. I called Nancy a "photo-evangelist" because of her undying spirit and enthusiasm for photography and her gift of sharing her love and knowledge. Sadly, Nancy passed away much too young and is truly missed by all who knew her. I do believe Lisa Cuchara is the only person I have met since who I would also call a "photo-evangelist." Her love of photography and the art of creativity (in camera and post-processing) is infectious. Not since Nancy have I met an individual who truly exudes inspiration and thrives on sharing her enthusiasm and knowledge with others. Thank you, Lisa (and Tom too!). "In this beautiful book, Lisa and Tom Cuchara share creative techniques for turning often-overlooked grungy subjects into masterful works of art. Learn to see in new ways with fresh eyes and go beyond a literal, documentary approach with your photography. Whether you’re a serious amateur or novice, this book will help ignite your passion for photography, in general, and challenge you to interpret what your eyes and heart see using your camera. Using a concise, easy-to-follow approach, Tom and Lisa outline specific methods for crafting images beyond your wildest imagination. I highly recommend this book to anyone wanting to take their creativity to new heights." "Lisa and Tom have a superb knack for finding incredibly fascinating places to photograph. They are encouraging, patient and terribly creative people whose energy and passion make you never want to put your camera down." Lisa and Tom Cuchara, through their keen vision, show us a world that has been forgotten; and they do it in a detailed, colorful and beautiful way. Tom and Lisa have found a way to take run down decaying subjects and turn them into an amazing art form. "Lisa and Tom celebrate the graceful degradation of things; both common and uncommon, and all beautifully captured." Lisa and Tom are an amazing photographic team, always enthusiastic and inspiring in their teaching and presentations. Their quest for a combination of perfect light, detail, and creativity consistently encourages the student to stretch in new directions, finding his or her own unique expression. Their images reflect their own spiritual journey, always seeking the perfect balance of light, color, and artistry. As a participant in many of Lisa and Tom Cuchara's workshops and field trips I have found them to be consummate professionals, dedicated teachers and exceptional photographers. Frequent presenters at NECCC conferences, Lisa and Tom have a strong following of devoted photographers. Their easy style has inspired me to have more faith in myself as a photographer and to have more enjoyment from my photographic endeavors. "We have learned so much by attending Tom and Lisa's classes and workshops. Their small groups allow for individualized attention which helps you to understand the concepts of photography and post processing techniques"
Lisa and Tom Cuchara are each accomplished photographers, lecturers, and workshop instructors in a variety of photographic styles and genres. They use a wide range of in-camera techniques to capture the image they see, and are masters at selecting and using the necessary post-processing tools to bring their images to life. Their passion for photography is obvious in their lectures and their enthusiasm is catching. They understand the necessity of a properly captured image in low light, and pass that experience on to workshop participants. Tom and Lisa have presented at numerous regional photography conferences, and have been regular participants in the New England Camera Club Council’s Annual Photography Conference over the last ten years; lecturing on a variety of topics and conducting numerous workshops on post-processing tools and techniques. 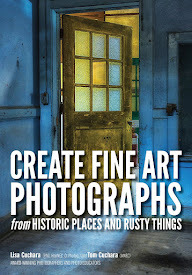 I’m looking forward to learning more about their techniques in capturing the essence of rusty and dusty subjects in this new book. Tom and Lisa and their amazing frogs have been a featured attraction many times at my annual macro photo conference. I have always been impressed by their extreme concern for the welfare of the frogs, and always making sure the frogs were never stressed during their photo sessions. 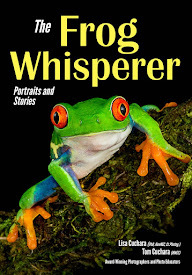 Lisa the Frog Whisperer and her husband Tom, have given us a gift of knowledge and laughter in this treasure of a book. Well known for the incredible images of their pet frogs, Tom and Lisa share their passion, techniques and insight, so you too can create images that make your heart sing. Prepare to smile or even laugh as you flip through the pages of this marvelous educational and fun book. ~John Barclay - Professional Photographer, Lecturer and Workshop Leader. Tom and Lisa are consummate professionals, and this book is an outstanding example of their skill, creativity, imagination, and even their sense of humor. Each image contained in these pages is a work of art executed with complete attention to detail. In addition to appreciating the beautiful photography, the reader will also gain a greater understanding how to light and compose macro subjects with detailed descriptions of the various setups. The text is as engaging as the photographs, with fascinating stories behind each picture. Frogs are remarkable creatures, and no one gives us such a stunning and intimate glimpse into their world as does Tom and Lisa. I first saw one of Lisa’s incredible frog images while judging a competition a few years ago. Since then I’ve seen many of Tom and Lisa’s outstanding images and I’ve heard them speak about their techniques for photographing these astounding creatures. Tom and Lisa are outstanding technicians, teachers and photographers. If you are interested in getting the best photographs of some of the world’s smallest creatures, this is the book for you. Lisa and Tom Cuchara are a unique couple that enjoy there passion for photography by living it. Both love to share their knowledge and help with detail as much as possible.But most of all I love their FROGS and the workshop they put out. I so enjoy that Lisa will not stress out her Babies and put them back to relax when necessary. I wish them lots of success. Lisa and Tom’s skill as photographers is only surpassed by their love of their subject. These amazing images are the result of extensive knowledge, patience and creativity. Frogscapes is exceptionally entertaining and inspiring. The word "frog" makes me think of Lisa and Tom ever since my unique opportunity to meet and photograph their frog family. A variety of subjects, affection for the amphibians and post-processing techniques were all part of the workshop. Props were extremely creative, funny and colorful, making it really easy to create memorable images that will bring a smile to any viewer's face. Lots of individual attention was received both by the frogs and the very limited number of participants per workshop. An ideal situation for everyone involved! Lisa and Tom have a true love for photographing frogs in a fun and artful way. I find their photography to be both unique and inspiring. They also have a passion for instructing and assisting photographers to obtain outstanding photographic results. If anyone should write a book about photographing small frogs, it’s Lisa & Tom Cuchara. I had a private session with the couple in their home, and marveled to see what must have been a hundreds of frogs, their cages lining the walls of that day’s photography studio. Tom played with my camera to make sure the settings were right, and Lisa set up the frogs in various environments. I immediately became engrossed, clicking off frame after frame of the little croakers. The two hours flew by, and I left, feeling exhilarated. That was a good day!